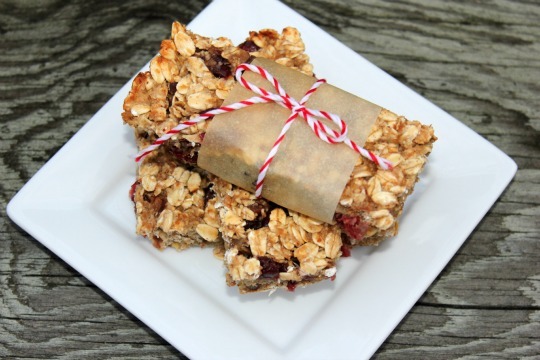 Making your own granola bars is easy peasy. This recipe makes low-fat, chewy bars in no time at all. Customize the bars to your liking by using whatever nuts or dried fruit you prefer. I used low-sugar craisins and pecans. 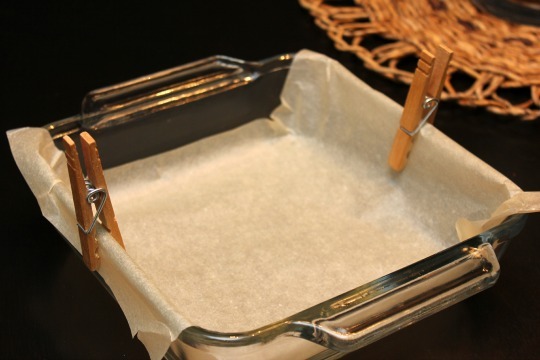 Make sure you line your bake dish with parchment paper to remove the bars easily from the pan. I use clothes pins to hold the parchment in place until I'm ready to put it in the oven. This prevents the paper from sliding all over the place. I use the back of a metal measuring cup to press the oats down before baking. Line a 9 x 9 inch bake dish with parchment paper making sure to leave some overlapping the sides. 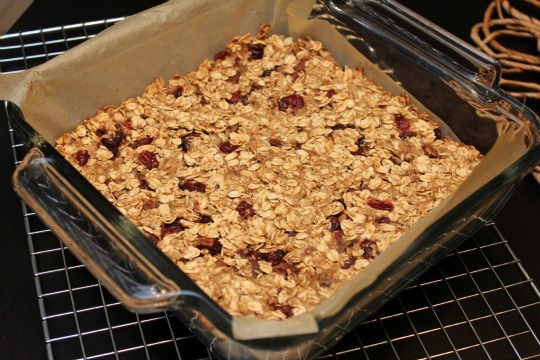 Spread the oats and nuts out on a cookie sheet and bake in the oven for about 10 minutes or until lighly toasted; stirring occasionally. Remove to a wire rack to cool. In a medium bowl, mash the banana with the back of a fork. Stir in the applesauce until combined. Pour the oats and nuts into a large mixing bowl. Add the craisins, ground flax seed, cinnamon, nutmeg and salt. Stir the banana mixture into the oat mixture until well combined. Pour into the parchment lined bake dish, pressing mixture down evenly. Bake for approximately 25 minutes or until golden brown. Cool on wire rack for 15 minutes. Lift the bars out of the dish using the edges of the parchment paper. Let cool for another 15 minutes before cutting into bars. Store in an airtight container or in Ziploc snack bags for a healthy snack on the go. Is the ground flax like a spice in these? I have never seen ground flax and I don't know if I ground flax seeds I have, if I could get them ground fine enough. SANDI. You can find flax seed at most grocery stores or definitely at a health food store. I grind my flax seeds in a Magic Bullet or your can purchase it already ground. Hope this helps. Those look delicious (and healthy) - and I really REALLY like the clothespin trick - brilliant! This says low fat, but I do not see calories or serving size listed here. Thanks.